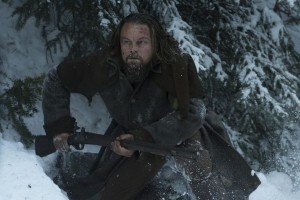 Very loosely based on true events, the film follows the experiences of frontiersman and fur trapper Hugh Glass (Leonardo DiCaprio). 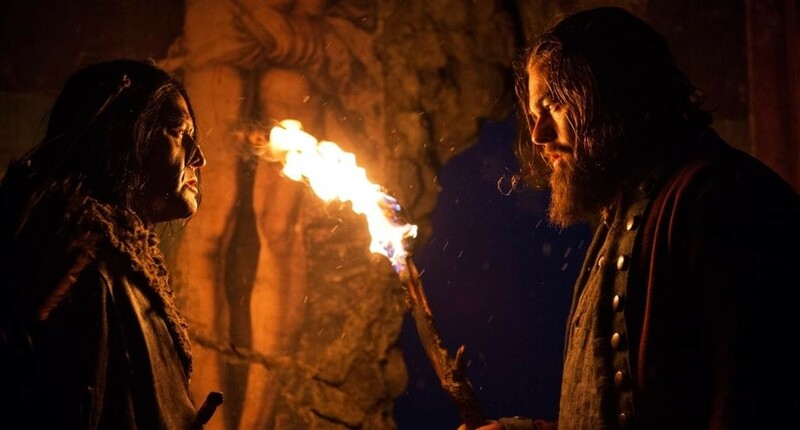 Part of an expedition led by Captain Andrew Henry (Domhnall Gleeson), Glass and his half-Pawnee son Hawk (Forrest Goodluck) are forced to retreat with the group when they come under attack by the Arikara, a Native American tribe. While scouting ahead, Glass stumbles across a grizzly bear, which mauls and leaves him unable to speak. The group tend to his wounds and attempt to move him on a makeshift stretcher, but it slows them down, compounding their situation since the Arikara are still tracking them. Henry asks for volunteers to stay with Glass until his death, and among them are Hawk, young Jim Bridger (Will Poulter), and the self-serving John Fitzgerald (Tom Hardy). In his impatience, Fitzgerald murders Hawk and convinces a reluctant Bridger to leave Glass for dead. 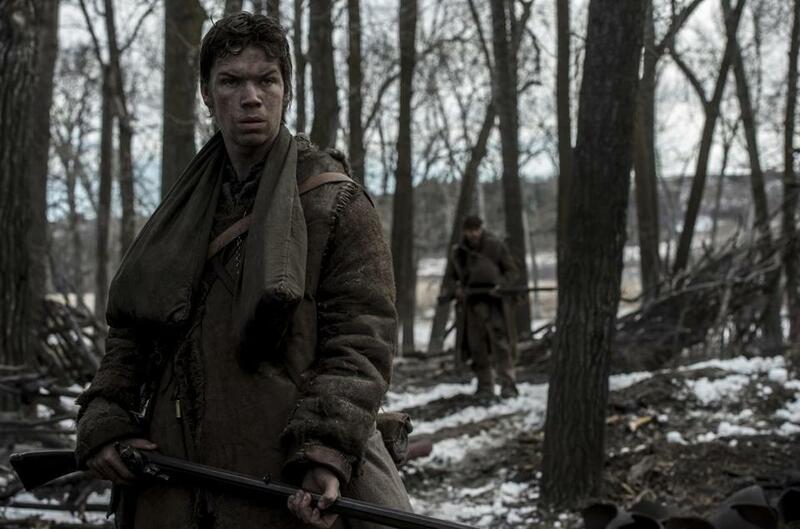 Guided by sheer willpower and thirsty for revenge, Glass – despite his broken body – begins a miles-long trek after them across a dangerous and snowy wilderness. Frankly, there’s barely anything to emotionally attach to in this tale. Glass’ journey is an excruciating and fascinating story, but Iñárritu – who co-wrote the screenplay with Mark L. Smith – isn’t concerned with portraying it with all the painstaking details and twists that make it so compelling. Instead, he shifts the focus of Glass’ experiences onto man’s appetite for destruction, of both nature and his fellow kind. It’s definitely a noble vision, but this idea – personified through images of sacked villages, a pile of buffalo skulls, a lynched Native American – remains just that, an idea to be observed. It doesn’t hold much weight, as the characters should interact with it but don’t, apart from a monologue from Fitzgerald that expresses his contempt for the world. That’s largely due to the way that the characters are handled, as the main two – Glass and Fitzgerald – remain flat and are never complex. In an attempt to make Glass a more sympathetic character, Iñárritu and Smith give him a son, but their relationship is merely artificial, especially when you consider the fact that Hawk is only here to die. Hawk, then, is merely a device meant to set Glass on a course, and even then, by the end of his journey, Glass is very much an unchanged character. Fitzgerald is meant to be a baddie, and the writers certainly give us many reasons to dislike him. The only figures of any interest are Bridger and Henry, as the knowledge of Glass’ “fate” and their roles in it clearly affect the way they look at themselves and how they conduct themselves around others. Peppered throughout this brooding, overlong film are action setpieces designed to leave us breathless. Granted, the most exhilarating ones occur within the first act and at the climax, yet they all impart the film’s sense of cold and bloody brutality, whether it be an arrow shot straight into a man’s throat or the blow from a hatchet chopping off some fingers. The bear attack scene is certainly the most memorable, sustained in a single take (or perhaps it’s edited to look that way á la Birdman) and capturing the bear’s every strike as well as Glass’ progressively weakening efforts to hold it off and kill it. Iñárritu skillfully builds and maintains tension throughout such sequences, and they are thrilling to see unfold. The film does boast a host of committed performances from its cast. DiCaprio – whose star image typically gets in the way of his work in his past few films – is a completely different beast this time around, as the film thrusts him into a role that is mostly silent and purely physical. He is well up to the task, as he crawls, wheezes, and expresses every emotion through his gaze, whether it be grief, helplessness, or rage. Hardy may be unintelligible through his mumbles and grumbles, but his turn as Fitzgerald clearly paints the man for who he is – an angry, desperate individual who only cares about himself. Gleeson is only in a handful of scenes, but he hits every emotional note with poise, whether it be in a quavering moment of indecision or another where he stamps his authority out of displeasure. The most surprising and compelling turn comes from Poulter, who never lets us forget that his character is a good-hearted person led into making difficult decisions, and he handles his scenes of grief and insecurity with confidence. 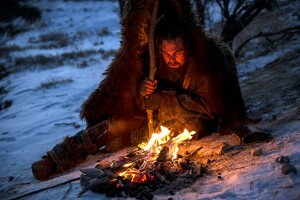 At the very least, the film is a showcase for cinematographer Emmanuel Lubezki’s exquisite photography. 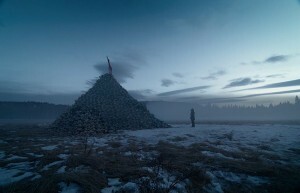 Much has been made about Iñárritu’s decision to film using only natural lighting, and regardless of what you think about it, you can’t deny that it grants Lubezki the license to capture some breathtaking pictures. It also lends the film an ethereal quality, and every shot – whether it be a single image or a single long take – makes the film seem otherworldly, as though we are meant to Mother Nature herself: very much in the proceedings yet also detached from them, like a silent god committed to noninterference. From the looks of it, people will talk more about what it took to film The Revenant rather than the picture itself. 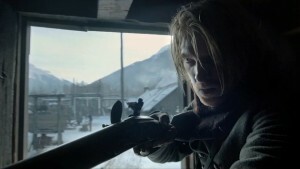 There’s no doubt that its long and troubled production is full of hullabaloo that makes for some interesting conversations, but when you look past it, there really isn’t much to talk about beyond the cast’s committed performances, exhilarating action sequences, and Lubezki’s cinematography. Glass’ survival story would make for a compelling film, but alas, it isn’t this one. Iñárritu certainly has an idea for what his movie can be build upon, but his characters don’t allow that idea to really take root and blossom.